From left: the dining room at La Cabrera, one of the best parrillas in Palermo Viejo; La Cabrera’s provoleta, a cow’s-milk cheese charred on the grill; Hesperidina, a minty aperitif served at El Preferido de Palermo. Until a few years ago, Palermo Viejo was mostly unknown outside Buenos Aires. The only reason anyone ventured into this leafy neighborhood, with its stately, century-old houses and makeshift auto shops, was if it was time to pay the family a visit or if the Peugeot was sick. Photograph by Juan Hitters/Sur Press Agencia. Food styled by Mariana Rapoport. La Cabrera’s pork shoulder wrapped in bacon. These days Palermo Viejo has the same thrumming energy as Silver Lake in Los Angeles or the Mitte in Berlin, and it’s the place where in-the-know travelers and hip locals alike go for their shopping (one section is known as Palermo SoHo) and night-life fix. It’s also home to the city’s liveliest dining scene, but here things get trickier to navigate. The area’s trendy status has brought many restaurants that, perhaps not surprisingly, are more about the soaring interiors and designer cocktails than the food. It’s not that a meal at this type of restaurant is bad, just generic: croquettes with clever fillings, crusted salmon served with a side of puréed something. Sit down for a dinner at Olsen, a fashionable and much-lauded favorite that looks to northern Europe for its menu (and midcentury Scandinavia for its décor), and you could be eating the same food, in the same setting, in London or in Manhattan..
Pacú, served at Jangada, is a succulent and rare treat. Still, there are great finds in Palermo Viejo, as there are throughout the city, which showcase Argentina’s rich culinary history and its bounty, which stretches from the ocean to the Andes. A handful of these are new restaurants that pay homage to this tradition and draw a crowd less interested in who designed the room than in what’s coming out of the kitchen. One is Jangada, where locals go for the pacú, a lumbering cousin of the piranha that can grow as large as 60 pounds. Jangada’s serving is the size of a porterhouse. Grilled until crispy, the flesh is firm but flaky, and so succulent that from the first bite you’ll understand how it earned its nickname, el lechón del rió, or suckling pig of the river. Pacú is worshiped in Argentina but a rare sight in Buenos Aires. And it’s certainly not anything you’ll find on a menu in the East Village. 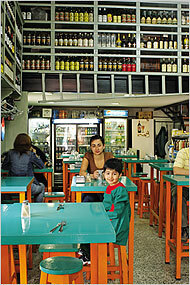 El Preferido de Palermo, a 75-year-old Italian grocery, attracts schoolchildren and businessmen alike. For those with more carnivorous appetites, the most obvious place to find authentic local cooking is at a parrilla, the classic Argentine restaurant that offers 20 or more kinds of grilled meats, mostly cuts of steak. It’s like a brasserie, genial and familiar, and the menus at each read mostly the same. Of the dozens of parrillas in Palermo Viejo, La Dorita may be the most famous, but La Cabrera, which opened just a few years ago, is the tastiest. You could make a meal strictly of starters, like the provoleta, a thick, round slice of cow’s-milk cheese charred on the grill and served sizzling hot with a topping of olive oil and dried herbs. It’s the ultimate mac-and-cheese, only all cheesy crust, no mac. Or go for the morcilla Vasca, Basque-style blood sausage that tastes of mulled spices. The menu offers plenty of beef, but the chef Gastón Rivera experiments with other meats, too, like bondiolita de cerdo, roasted pork shoulder wrapped in bacon, and pato en confit, duck confit grilled until crispy. The chinchulines de cordero, or lamb chitterlings, cooked to a golden brown, could convert any offal skeptic. And if your stomach can handle it, you could order it all, since one of the real thrills of dining out in Buenos Aires is that it’s embarrassingly inexpensive. The Argentine peso was once at a one-to-one exchange with the dollar, but now it’s settled at about three to one, which means that at La Cabrera, one of the most expensive parrillas, the provoleta, at 13 pesos, will set you back just a tad more than $4. The bondiolita, at 23 pesos, costs less than $8 and can easily feed several. An indulgent dinner for two will total about $40, and if you budget another $20, you can let your finger drift to the bottom of the wine list. While La Cabrera is a faithful re-creation of the traditional parrilla, some of the best of Palermo Viejo’s new places are about tweaking tradition. Elles, which opened last year in a former house and garage, has a small, and very good, menu of French-inspired dishes and cleaned-up Argentine classics like chipirones a la plancha, or seared baby squid with corn, and bife de chorizo, grilled rib-eye. The space has been whitewashed and left empty except for mismatched oak furniture and an opulent chandelier, giving the room a loftlike elegance. At Divina Patagonia, the regional sampler platter offers a refined introduction to the ingredients of the rugged south: an assortment of sausages, cheeses and cured meats, including smoked deer sliced as thin as prosciutto. Main courses are hearty dishes in delicate portions — Patagonian lamb, deer loin, wild boar braised in beer. A wave of Italian immigration in the late 1800’s left a lasting impression on Argentina’s culinary landscape: the grilled steak may be the country’s most celebrated dish, but the Milanesa, a breaded veal cutlet, is its comfort food. Order it at El Preferido de Palermo, a 75-year-old Italian grocery and lunch counter, where schoolchildren in uniforms jockey with businessmen in suits for one of the chest-high tables. Milanesa de peceto comes piled high with fries or topped with tomato sauce and melted mozzarella. If you have time, you might linger over the gran picada, an antipasto sampler with 13 different small bites — sausages, olives, wedges of frittata, a hard-boiled quail’s egg neatly sliced in half — accompanied by Hesperidina, an Argentine aperitif every bit as minty and murky as an Italian fernet. Just a couple blocks away is Casa Cruz, Palermo Viejo’s most fashionable restaurant and the site of a nightly crush of actors, politicians, soccer stars and paparazzi. You can find entourages and expensive drinks there, and, for that matter, anywhere, but you can find food like La Cupertina’s only in Argentina. Palermo Viejo is home to some of the city’s newest and coolest places to stay. 1555 Malabia House High-design B&B in a historical building. Malabia 1555; 011-54-11-4833-2410; www.malabiahouse.com.ar; doubles from about $105. Bo Bo Hotel Boutique hotel with modern rooms and a popular restaurant. Guatemala 4882; 011-54-11-4774-0505; www.bobohotel.com; doubles from $100. Five Cool Rooms In fact, 16 rooms, modern design and a great roof garden. Honduras 4742; 011-54-11-5235-5555; www.fivebuenosaires.com; doubles from $90. Home Hotel Bright rooms and a hip English-speaking staff, with a pool and a garden in the middle of the city. Honduras 5860; 011-54-11-4778-1008; www.homebuenosaires.com; doubles from $115. For luxe digs outside the neighborhood, try the new Palacio Duhau-Park Hyatt (011-54-11-5171-1234; www.parkhyatt.com; doubles from $410) or the classic Alvear Palace Hotel (011-54-11-4808-2100; www.alvearpalace.com; doubles from $550), both in Recoleta. La Cabrera Cabrera 5099; 011-54-11-4831-7002; entrees about $6 to $12. La Cupertina Cabrera 5300; 011-54-11-4777-3711; entrees $3 to $5. 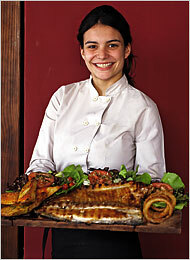 Divina Patagonia Honduras 5710; 011-54-11-4771-6864; entrees $6 to $13. Elles Honduras 5916; 011-54-11-4777-9555; entrees $8 to $11. Jangada Honduras 5799; 54-11-4777-4193; entrees $5 to $19. 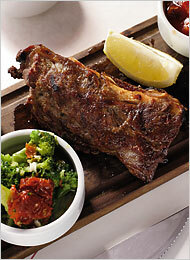 El Preferido de Palermo Jorge Luis Borges 2108; 011-54-11-4774-6585; small plates $1 to $5.